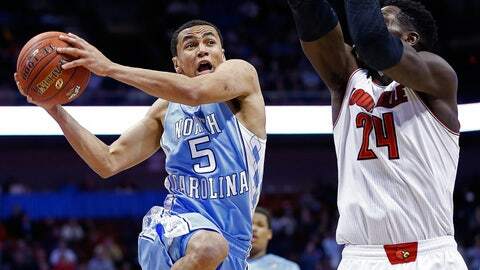 North Carolina sophomore guard Marcus Paige led the Tar Heels to an upset of Louisville with 32 points on Sunday. Seventeen days into the season, and there is no definitive No. 1 team. That may come off as an unfair assessment of this week’s AP No. 1, Michigan State, but there’s just such a slim margin of separation between the Spartans and, say, Kansas or Ohio State. Oklahoma State and Arizona may not have the marquee win like then-No. 1 Kentucky on its belt, but those teams also haven’t struggled against the likes of Columbia.The list goes on, even into the one-loss teams that have hit early snags. And if quality wins against a tough schedule were really all that mattered at this time of the year — it shouldn’t — could any team match UMass’ 6-0 start? The point here is that with so many cupcakes eaten and unbalanced schedules around the country, we have an extremely general concept of what the college basketball landscape looks like right now. There are too many unknowns. This time last season, Indiana and Duke captured every first place vote, then didn’t make the Final Four. Three seasons ago, it was Duke taking all 65 first-place votes at this point before Ohio State shellacked the Blue Devils by 22 in the ACC-Big Ten Challenge. Then there’s John Calipari’s Kentucky squad that essentially went coast-to-coast as the No. 1 team around. It goes both ways. Are the Spartans the 2012 Wildcats or the 2013 Hoosiers? No idea. Nothing against the Spartans or any other team that claims the top spot in the next couple of weeks, but in most "No. 1 v. The Field" scenarios in sports, take the field. Every time. In college basketball right now, double down on it. 1 Back in mid-October, before the Champions Classic or the holiday tournaments or the 39-point game in a national Tuesday showcase, Oklahoma State star Marcus Smart’s eyes were pointed northeast, toward Allen Fieldhouse and Rock Chalk and all the aura that comes with it. In an interview with USA TODAY, he spoke specifically about a freshman — The Freshman — in Lawrence, Andrew Wiggins, the highest-rated recruit in the country and the center of college basketball’s attention. Smart wanted him to prove it: "They are saying he is the best college player there is and he has not even played a game yet … It is all talk. He still has to put his shorts on one leg at a time like I do. It is all potential. I am not saying he can’t do it. But he has not done it yet." In the month since, that talk has shifted, if ever so slightly or briefly, to Smart, the Cowboys’ point guard who declined a surefire lottery selection in last June’s NBA Draft to return to Stillwater. After three walk-over wins, the 6-foot-4 sophomore captivated the national sports conversation with a 39-point, five-steal, four-assist and four-rebound takeover of then-No. 11 Memphis. In the aftermath, he’s been everywhere. 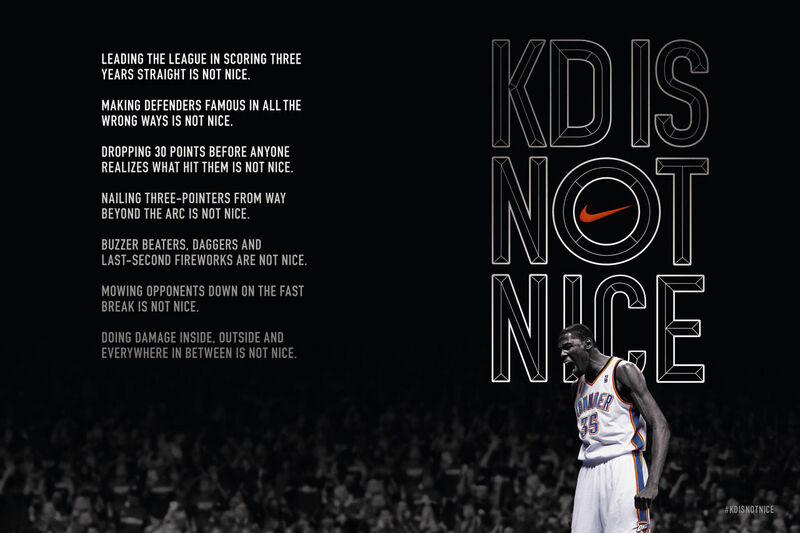 Kevin Durant sat courtside for the game and "made national headlines" by saying Smart was ready for the NBA. He even made a national TV appearance prior to his school’s pivotal showdown with previously-undefeated Baylor in football. As for Wiggins, he’s only averaging 16 points and six rebounds, including an impressive two-way effort against Duke on Nov. 12. On a deep Kansas team, he’s fitting in just fine. But Smart made his point in October and has backed it up to date: When he decided to return to Oklahoma State following a Big 12 Player of the Year and All-America season, he cemented the fact that this is his league until proven otherwise. It might even be his Naismith Award to lose, too. Spurned on by their sophomore leader, the fifth-ranked Pokes feature athletes all over the floor and are in prime position to make a deep run in March, topping out Ken Pomeroy’s efficiency ratings through their first four games. The humorous side of the Durant quote above — catchy and interesting as it may be — is that one has to wonder if the former Big 12 standout knew Smart was projected to be a top-five pick in the ’13 Draft. So of course he could play in the league right now … he almost did. It was basically a complimentary quote that states the most obvious fact of all following Smart’s demolition of Memphis. 2 In two separate games on Sunday, two opposing players put up 30-plus points. In the Hall of Fame Tipoff Tournament, it was one of the nation’s preeminent volume scorers, Russ Smith (Louisville), and sophomore Marcus Paige (North Carolina) putting up career-high point totals. A few hours later and 1,500 miles away, in-state rivals North Dakota and North Dakota State saw Troy Huff and Taylor Braun hit the 30-point plateau. These are the types of individual performances that have been rare in college basketball of late. If the sport hit ratings highs last season, then those numbers should only climb higher with a more scoring-friendly environment. Very few pay to see false charges, top scorers on both teams held to 6-of-17 shooting in ultra-physical conditions or a 52-48 outcome. Looking at Sunday’s results, only one game suffered such a brutal fate (Kansas State-Long Beach State). That’s certainly better than half the games. This may come as a surprise, but in case this slipped by unnoticed over the past few weeks, college basketball players are capable of scoring points at a consistent rate. Funny how enforcing the rules of the game will allow for more true scoring opportunities. 3 Late last Wednesday night, Archie Miller wandered the back corridors and stairs of McCamish Pavilion looking for his ride: "Where’s the bus? I don’t have any other interviews, do I? I just want to find the bus." The Dayton coach had just knocked off Georgia Tech — and former Flyers coach Brian Gregory — in arguably the biggest road win in his two-plus seasons as the man in charge of the Atlantic 10 hopefuls, but he had already grown weary of the media attention. He just wanted to find his players, their vehicle and the fastest route to Maui. Given his family’s competitive history, that seems par for the course. The Miller boys, Archie and Sean, both former collegiate standouts from a coaching family, are undefeated this season. Sean’s start is the least surprising of the two, as he has built upon a past legend’s foundation and multiple highly-regarded recruiting hauls to position the fourth-ranked Arizona Wildcats as a popular Final Four selection early on. With the likes of Aaron Gordon and Nick Johnson leading the way, the Wildcats have rolled through the early portion of their schedule, winning by an average of 26.8 points per game. Even in a difficult road environment at San Diego State, the elder Miller’s club jumped out to an early lead and never relented. In his first two years at Dayton, Archie’s teams finished 37-27. But there’s some symmetry here: Sean made his coaching debut at Xavier following Thad Matta taking the Ohio State job and immediately went 38-23 with a young roster. It took time. Though Xavier made the NCAA Tournament in 2006 (Sean’s second season), it wasn’t until the third installment that the Musketeers registered a 25-9 record and a tourney win — before losing in overtime to Matta’s Buckeyes the next round. Archie is looking to take a similar step in Year 3 with a balanced group led by seniors Devin Oliver and Jordan Sibert along with sophomore standouts Dyshawn Pierre (who played sparingly due to foul trouble against Georgia Tech) and Khari Price. The A-10 is not wide-open, though. Along with the Flyers, four conference teams are off to undefeated starts (Saint Louis, UMass and George Washington) while the fifth, VCU, has taken two losses but entered the season as a top-25 team and the preseason favorites. The Flyers will get their biggest test to date Monday night against Gonzaga in the Maui Invitational, but, given the competitive nature of the Miller family, there ought to be a wager on which program avoids a loss the longest. Winner cooks Thanksgiving meal. 4 Look no farther than the top of the polls for the most impressive starts to the college basketball season: Smart’s Cowboys look dangerous; Duke, Kentucky and Kansas are doing just fine in their freshmen-dominant systems; UConn, Louisville, Michigan State, Ohio State, Wisconsin â¦ each have had good moments. It’s also simple to weed out disappointing beginnings. Georgetown (3-2): Ignore the Northeastern loss, it’s not as bad as it sounds. The Hoyas have received better-than-expected production from big man Josh Smith, feature high-quality guard play, lost to a very good Oregon team and have decisively beaten Wright State, Kansas State and VCU. Bucknell (3-2): This team has not fallen off the radar with the graduation of star big man Mike Muscala, taking two respectable losses to Stanford and St. John’s by four points apiece and beating Penn State by 10 on the road. Boston College (2-4): The Eagles have lost by four points to Providence (overtime), two points to UConn, three points to Toledo and double-digits to UMass. Sure, there should be a win in there, but don’t give up on this team, which beat Washington over the weekend, just yet. La Salle (3-3): Last March’s Cinderella darlings have taken three losses (Manhattan, Penn State, Providence), but none by double-digits and one in double-overtime. The Explorers need to prove they can play some defense and win a close game, but don’t discount this upperclassmen-laden roster. Purdue (4-0): Defense has been a problem for the Boilermakers (117th nationally in efficiency), and beating Northern Kentucky and Eastern Illinois by a total of five points is not promising. Missouri (4-0): The Tigers have not registered a quality win, and letting the likes of Southern Illinois, Hawaii and Gardner Webb hang around in successive games is not a good sign. Mizzou is putting up decent offensive numbers but won’t likely be tested until a run of West Virginia, UCLA and Illinois next month. USC (4-1): Andy Enfield’s inaugural season in Los Angeles has been filled with cupcakes and sub-par offense, and the one quality team the Trojans faced (Utah State) won by 13. Back-to-back games against Villanova and Boston College this week will paint a more accurate picture. Texas A&M (4-0): There’s just not a good win among the likes of Buffalo, Mississippi Valley State, Rice and Prarie View â¦ and the Aggies trailed Rice with less than five minutes remaining in the game. Sure, there are preseason favorites to win the Naismith Award. However, it’s a bit too early to start naming definitive names. So we’ll run with some of the remaining top performances from the past week, keeping in mind this will transform into the National Player of the Year watch in December. Of course, Paige is playing off the ball more now due to UNC’s depth on the wings, with freshman Nate Britt seeing some more minutes at point, so the comparison is not perfect. All the same, he looks dramatically improved from his hot-and-cold freshman year, but it’s early and the numbers will only become more and more reliable following games against Michigan State, Kentucky, Texas and Davidson before Christmas. Alex Kirk, New Mexico: Following an impressive showing in the Charleston Classic, the 7-footer and his teammates went to watch Katniss Everdeen. But Kirk is the one who was … wait for it … catching fire (never apologizing) over the weekend, averaging 21.3 points and 12 boards against UAB, UMAss and Davidson. A surprisingly smooth scorer from all over the floor, he’s shown marked improvement this season while logging more minutes than anyone on the New Mexico roster. Roberto Nelson, Oregon State: After reading George Dohrmann’s book on AAU and youth basketball, Play Their Hearts Out, a few years back — yes, that was a subtle transition from New Mexico, which featured the star of Dohrmann’s book, Demetrius Walker, from 2011 to 2013; Walker is now at his third school, Grand Valley State — Nelson’s name in the college game has been a familiar one. But not many know just how dangerous of a scorer he’s become. The 6-foot-4 guard has put up three consecutive games of 24-plus points, including a 31-point, seven-assist outing against Maryland. Before last season, Beavers head coach Craig Robinson said Nelson had the ability to "transcend" his team and after playing more than 90 percent of available minutes and taking nearly 40 percent of shots when he’s on the floor (with an offensive rating of 127.2) this season, it’s clear Oregon State’s season is in Nelson’s hands. Jordan Adams, UCLA: Losing Adams to injury on March 15 last season certainly did not help former Bruins coach Ben Howland’s chances of keeping his job in Westwood, as the team dropped its regular season finale to Oregon before being obliterated by 11-seed Minnesota in its NCAA tourney opener. But Howland’s loss is Steve Alford’s inheritance, and Adams is beginning to live up to his five-star billing as a prep player out of Oak Hill Academy. He’s put up four straight games of 20-plus points and will look to keep it going as the schedule begins to ramp up. Charlotte: The 49ers were ignored in the Fourth Corner above because they’ve proven themselves to be a very good team — no qualifier required. The C-USA participants had knocked off East Tennessee State, Elon, Kansas State and Northeastern (the same one that beat Georgetown and took Florida State down to the final possession on Sunday) heading into Sunday’s Puerto Rico Tip-Off final against 14th-ranked Michigan. After a last-second tip-in by junior Terrence Williams, Charlotte added the Wolverines to its laundry list of quality wins, 63-61. Under fourth-year head coach Alan Major, another former Matta assitant, the 49ers are getting out in the open court and averaging more than 75 possessions per game (14th nationally). Though they don’t do anything particularly spectacular, they were able to hold the Wolverines to 31 percent shooting and kept the reigning NCAA runner-ups off the glass. Confirmation bias aside, Charlotte deserved to crack the polls this week with that resume, at least over No. 25 Marquette. Marshall: Staying in Conference USA, Elijah Pittman is the league’s early frontrunner for Player of the Year after five consecutive games of 20-plus points to start the season. In fact, Pittman is just one of three players nationally to post at least three 30-point nights thus far (Niagra redshirt junior guard Antoine Mason, the nation’s leading scorer, has four such games), putting him at fifth on the nation’s scoring leaderboard — not to mention catapulting his point guard, freshman Kareem Canty, near the top of the national assists per game list. After running into some offseason trouble (indicted on a misdemeanor battery charge back in August), the 6-foot-9 senior has lived up to coach Tom Herrion’s promises. The uptempo Thundering Herd may not be very good — the defense has been particularly porous against below-average competition — but they’ll go as far Pittman can carry them, as he’s taking 37.5 percent of the team’s shots when he’s one the floor and he ranks second on the team in rebounding. Massachusetts: With high-major type players Chaz Williams and Cady Lalanne leading the way, the Minutemen are approaching that glorified point for mid-majors when they aren’t truly considered "mid-majors" — think more along the lines of Gonzaga (annually), Butler or VCU in recent seasons. UMass is 6-0 with wins over Boston College, LSU, New Mexico and Clemson. The latter of those four quality came in the finals of the Charleston Classic on Sunday, as Lalanne paced the action with 20 points and 12 boards. To repeat the Third Corner’s conclusion, the Atlantic-10 looks loaded at the top. Harvard: On Sunday, Colorado became the first team to hold the Ivy League favorites under double-digits in offensive rebounds while handing Harvard its first loss of the season. The Crimson have made a living on the offensive glass this season. Prior to the Colorado game, they ranked seventh nationally, but Buffs’ big men Wesley Gordon (6-foot-9) and Josh Scott (6-foot-10) gave Harvard a lengthy look they hadn’t yet faced this season. Still, an eight-point road loss is not a disappointment — though blowing a 12-point halftime lead might be — as Tommy Amaker’s team moves on to face an underrated slate of Denver, Northeastern (Huskies references ad nauseam this week) and Boston University over the next week or so. » This week’s Arizona State-Creighton matchup has a chance to be a high-wire act of basketball intrigue. With two prospective All-American candidates in Carson and Creighton’s Doug McDermott, all focus will, for good reason, be on the stars. For those yet to see Carson play, the sophomore floor leader is off to a ridiculous start — he poured in 40 against UNLV last week — and he’ll get see some good competition from the Blue Jays’ efficient backcourt of Austin Chatman and Grant Gibbs. The player to watch here will be a Jordan Bachynski, a 7-foot-2 presence in the low post with the ability to alter shots and clean up on the defensive boards (29.9 DR rate, 20th-best nationally). His offensive game is improved since scoring just eight points in a loss to Creighton last season, and he will be circled on the undersized Jays’ scouting report. This pits two high-scoring offenses against not-as-highly-regarded defenses, so let’s say first to 85 wins. » It’s Florida-Florida State week in the Sunshine State, and while the football version looks to factor into the BCS title race, the basketball variety should offer a better matchup. The defensive-minded teams both have taken losses to good teams in Michigan (FSU) and Wisconsin (Florida), but the Gators look much more balanced at the moment. As senior guard and top on-ball defender Scottie Wilbekin returns from suspension this week (just in the nick of time; starting point guard Kasey Hill went down with a high ankle sprain against Southern), they should be even better. During Wilbekin’s absence, another senior, Casey Prather, has become Billy Donovan’s go-to scorer (17.6 points per game) while being utilized on nearly a third of the Gators’ possessions. FSU has the personnel to slow Prather & Co. down, but the Seminoles’s offense needs to cut down on its turnovers (21st-worst nationally) to stay competitive in this one. » VCU fell out of the top-25 this week following losses to Florida State (an 18-point beatdown) and Georgetown. Opponents are shooting at an effective clip and getting to the free throw line against the Rams’ Havoc defense, while the offense seems to have taken a step back this season. That’s the bad news. The good news is that the defense is still forcing turnovers better than almost any team around and facing formidable defenses like Virginia, Florida State and Georgetown in three of a teams’ first six games is bound to (avoids linking video) skew a team’s offensive numbers. There’s improvement to be made, but trust in Shaka Smart’s track record. » Remember those maple syrup-infused Cinderella runs by Vermont during the early part of this century, when three-time All-American Taylor Coppenrath was putting up 30-point games against Division I powerhouses and the program won its first-ever NCAA tourney game against Syracuse? Well, Coppenrath is off playing basketball in Spain and this season’s Catamounts look vastly different (1-6) — and they still took a loaded Duke team down to the wire in a one-point loss. So, what does that mean for the Blue Devils? For one thing, Mike Krzyzewski has some work to do with his team on the defensive end. After giving up 77 points to Davidson, 94 to Kansas, 74 to East Carolina and 90 to Vermont, Duke ranks 176th nationally in defensive efficiency, which I feel confident saying would be the worst mark in Coach K’s past two decades on the bench. Maybe longer. No Duke team in the efficiency era has ever given up a point per possession — this one is allowing an average of 1.034 points when its opponent has the ball. That could be a product of getting all the parts to work together, or possibly the effect of working without a true post presence defensively (much like how Krzyzewski’s Olympic team struggled at times when it "went small.") All that said, the combinations are working on the offensive end. Jabari Parker and Rodney Hood are stars, Quinn Cook looks like he’s taken a big step forward and the complementary pieces are more than capable. Facing off against Alabama in Madison Square Garden, pay attention to the game’s pace. If Anthony Grant’s slow-it-down Crimson Tide can throw the Blue Devils’ offense out of rhythm and turn it into a halfcourt grinder — hence putting more pressure on Duke to come up with stops — it will be interesting to see how the Blue Devils respond.